From the moment Weston family patriarch Beverly (Chelcie Ross) delivers the first lines of Tracy Letts' August: Osage County during its November-January detour through London, it was clear that the pinpoint precision of Anna D. Shapiro's direction of her excellent ensemble could not be any finer. In fact, not since first seeing the play at Chicago's Steppenwolf a year ago last August with the original Beverly -- the late Dennis Letts, father of the now Pulitzer Prize and Tony Award-winning playwright -- have I witnessed his opening monologue on marriage, drinking, pill-popping and sheer Americanism delivered so potently or ominously. While Broadway audiences roared with laughter a bit more indiscriminately than their Chicago counterparts who were more rapt with attention, the London audience was surprisingly somewhere in between. Letts, Shapiro & Co. have succeeded in getting the Brits to let down their guard. And how could they help it, given the sterling performances by original cast members Deanna Dunagan, Amy Morton, Rondi Reed, Sally Murphy, Mariann Mayberry, Kimberly Guerrero, Jeff Perry, Ian Barford and Troy West, which remain as powerful as ever. I'm pleased to note that new castmembers Molly Ranson as Jean Fordham (Ranson understudied the role on Broadway), Paul Vincent O'Connor as Charlie Aiken (a dead-ringer for the original Charlie Francis Guinan), Gary Cole as Steve Heidebrecht and Chelcie Ross fit right into the often chaotic mix quite seamlessly, as if they belonged there all along. If there was one surprise for me, it was the fresh perspective I gained in seeing this decidedly American play outside the United States. Beyond Letts' direct references to the so-called "Greatest Generation" came his own State of the Union address. Given the ongoing economic crisis, his summation of how America is faring now seems rather prescient in retrospect. It's that extra nuance that imbues August: Osage County with a sobering accounting of the American lifestyle itself that somehow eluded me on my three earlier viewings. It's also what makes this theatrical masterpiece even more vital today than it was when it won five Tony Awards six short months ago. The Melbourne Theatre Company will staging a production of this play in mid-2009. They've got a very strong season of new and classic Australian and International works coming up, but I am looking forward to "August: Osage County" the most. Crossoverman, Thanks for letting me know. I was unaware that any other productions had already been planned other than the upcoming North American tour. That is exciting news! Anyway, so glad to hear the show has made a successful trip across the pond. 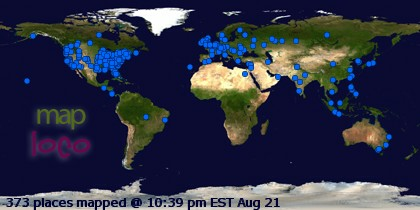 I'm glad to hear that London is warmly receiving AOG. I have been a Steppenwolf subscriber since I moved to Chicago in '95. Tracy, Rondi, and MaryAnn Mayberry have long been favorites of mine. This play added Amy Morton to my favorites roster. I used to watch Ian Barford when he was in Illinois Shakespeare Festival while at student at ISU. It's great to see them all get the interntational stage (and recognition) they deserve. I'd love to see them all make it to the movie, but we know that's not going to happen. Chris, Unfortunately, I have not yet had a chance to see DTE, but am still hoping to. Appreciate your perspective! Gay CME Guy, I'm in complete agreement with you on every count. However, I have to say that I was hooked on Amy Morton after seeing her in Steppenwolf's 2001 revival of One Flew Over The Cuckoo's Nest on Broadway. That show, and a subsequent viewing of Purple Heart at Steppenwolf the following year, were enough to inspire me to begin supporting Steppenwolf as a subscriber when I moved to Chicago (for a brief year) in 2005. In fact, I also joined the Board of Governors as an Auxiliary Council Member and ponied up as a Directors Circle subscriber (the latter is the way I now remain involved). Even though I no longer live in Chicago, I have been absolutely blown away by Morton in shows like Betrayal and The Well Appointed Room. 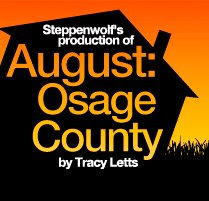 Then, of course, came August: Osage County, which I've been proud to champion on this site over the past year and a half. But whether it's an opportunity to see Amy Morton or one of the countless other ensemble members, I make it a point to get to Chicago for every opening night. I'll be back there this Sunday for the latest: The Seafarer, but something tells me that Amy Morton and the rest of the August: Osage County cast members will still be on everyone's minds. Interesting, SOB. We had completeled different reactions. I actually loathed Amy as Nurse Ratched in Cukoo's Nest, and it took me a long time and many other shows to come to appreciate her for great talent she is. She was excellent in the Upstairs Theatre in The Cherry Orchard a few years back. I have a horrible memory, for details, and can't think of the titles of the plays over the past few seasons where she and Tracy played opposite each other. They have a great rhythm and shorthand with each other. I'll see Seafarer just before Christmas. Will you review it here? An aside, RE: Well Appointed Room--Greenberg is another one of my favorite (living)playwright. Given all the point on which we do agree (Morton was opposite Letts in both The Well-Appointed Room and Betrayal), I guess we'll just have to agree to disagree about Nurse Ratched. And yes, of course, I'll be reviewing The Seafarer here. But you should know in advance that I was crazy about the Broadway mounting.